Rich, textured blouses, accented in embroidery. Chunky necklaces. Vibrant, full skirts that swept the floor. To legendary Mexican artist Frida Kahlo, she of dark unibrow and ribbon-braided hair, clothing was a means of self-expression. She wasn’t one to fade into the scenery. But then, the same can be said of Buzz resident Robin Russell. At least this day. In her self-made Frida Kahlo tribute jacket. 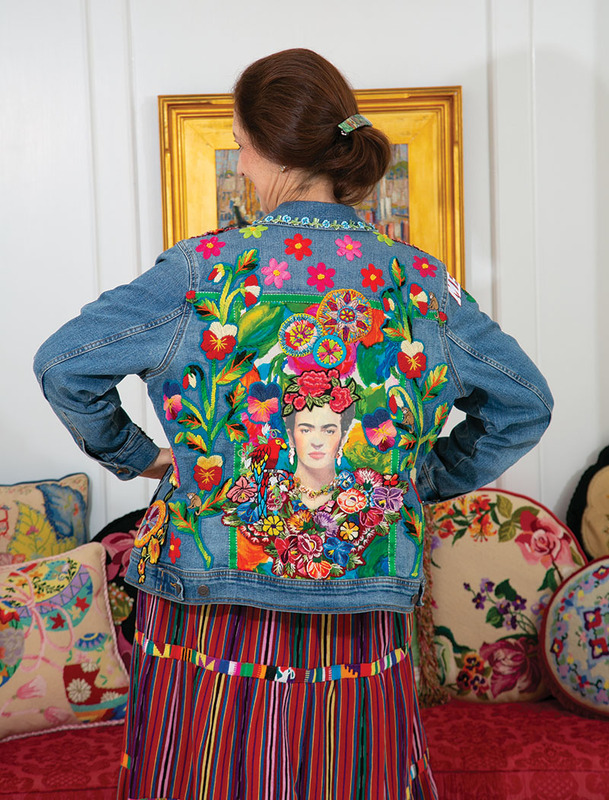 “I love everything about her,” says the enthusiastic Frida fan, her denim jacket abloom in floral stitchery, embroidered felt circles, appliques and sewn-on pieces from vintage apparel. Robin’s wearable homage is a full-on Frida frenzy in flowers, birds and monkeys, with the icon’s stoic face, topped in pink bouquet, as centerpiece on the back. The more color, the better, where Robin’s concerned. 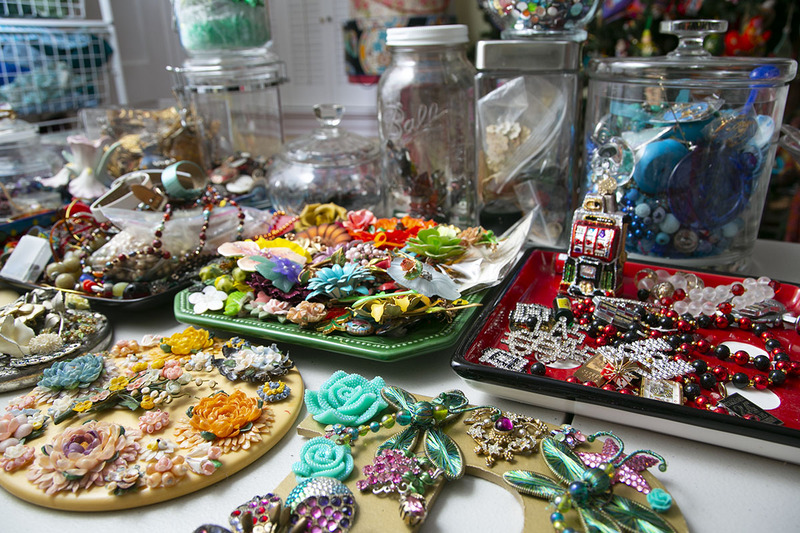 Her second-floor home studio is a kaleidoscopic explosion of craft projects, fun trinkets, folk art and works-in-progress. Needlepoints. Art quilts. Hand mirrors adorned in flowery brooches made from shells. Holiday-themed tabletop trees, sparkling in baubles. This is her temple of creativity, her go-to place when not poring over bankruptcy litigation and other matters of import as deputy managing partner of the large law firm Hunton Andrews Kurth. This is a major lawyerly abode, shared with husband Jim Paulsen, a professor at South Texas College of Law Houston. He has his own creative lair here, a two-story law library with books galore and fun, foraged finds. Expert scavengers, this empty-nester couple. They love to hit a good garage sale. Her hands have been busy since young girl days in Devine, Texas, a ranching community near San Antonio. Her maternal grandmother, Lucie Matilda Trader Filson, hand-hemmed linen napkins and tablecloths. She crafted Christmas stockings, crocheted afghans. Robin, the youngest child in the family, and the only girl, must learn to sew, her grandma decided. So she convinced sewing class instructors at San Antonio’s Joske’s department store to let the 6 year old enroll. It was here that Robin learned the physics of a good stitch, the mechanics of morphing fabric into clothes. She remembers sewing an apron, and a royal blue cotton skirt that she wore to church. “I wound up sewing all my clothes and all my mother’s clothes,” she says. So the class valedictorian of Devine High School set off for Texas Tech University, full scholarship, to get a home economics degree. 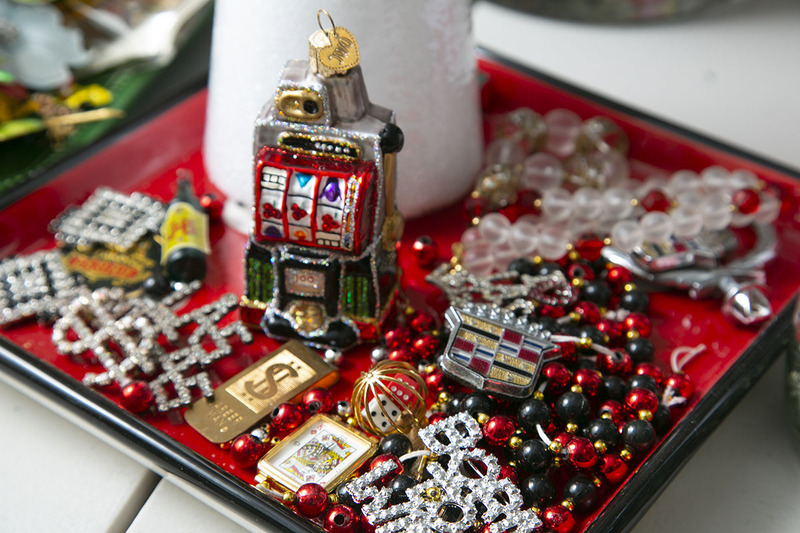 An exchange-student trip to Japan before freshman year had further cemented her love of craft. She hand-sewed a kimono with the host family’s grandmother. Never mind the language difference. Hands did the talking, stitch by stitch. “Life experiences opened my eyes to other possibilities. 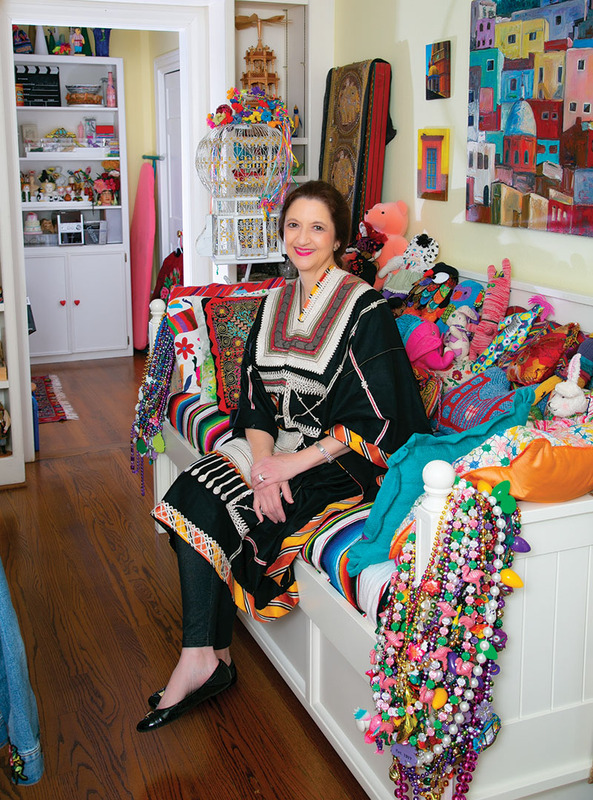 I didn’t necessarily have to be a home economics teacher in Devine, Texas, to do sewing and needlepoint.” She graduated with an interdisciplinary economics degree in international trade, then moved on to Baylor Law School. Seems law and craft share some skill sets. Last summer, big picture in mind, Robin carefully applied appliques, embroidery and precision stitches to denim, slowly turning ordinary jacket into extraordinary art. Like Frida, she wears it proudly, a statement of self.